A 57 mile loop can be made in a high clearance vehicle through Cathedral Valley, via Hartnet Road and Caineville Wash Road. 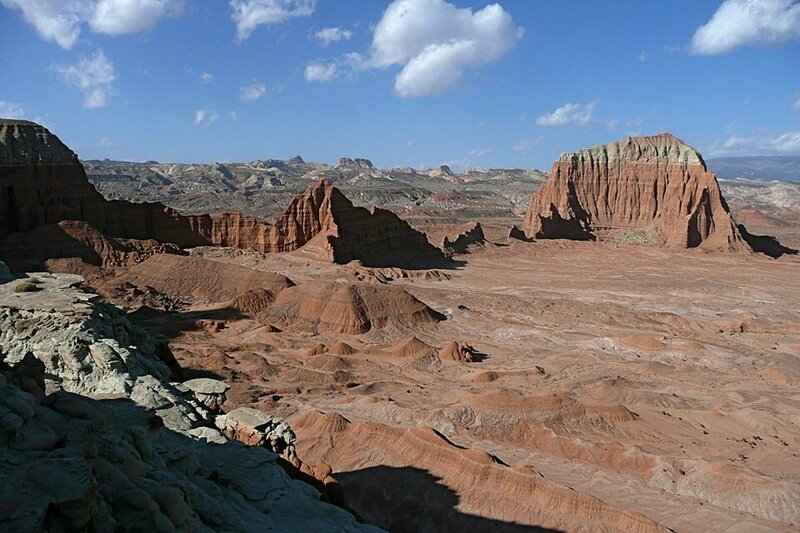 More than half of the trip is outside the Capitol Reef National Park boundary but that's just a technicality. We took the clockwise route which begins about five miles east of the park boundary where the dirt road turns north and fords the Fremont River. (During high runoff, the river may be impossible to cross.) A dozen miles or so takes you through a high desert environment; North Blue Flats and the Bentonite Hills, to a side road leading west across the park boundary. This side road takes you to the Lower South Desert Overlook. It's a short walk from a small parking area to this view of the South Desert and Jailhouse Rock. There's a longer hiking trail here which leads past Jailhouse Rock to Temple Rock.